Square Base - 11.5 cm / 4-1/2 inches approx. 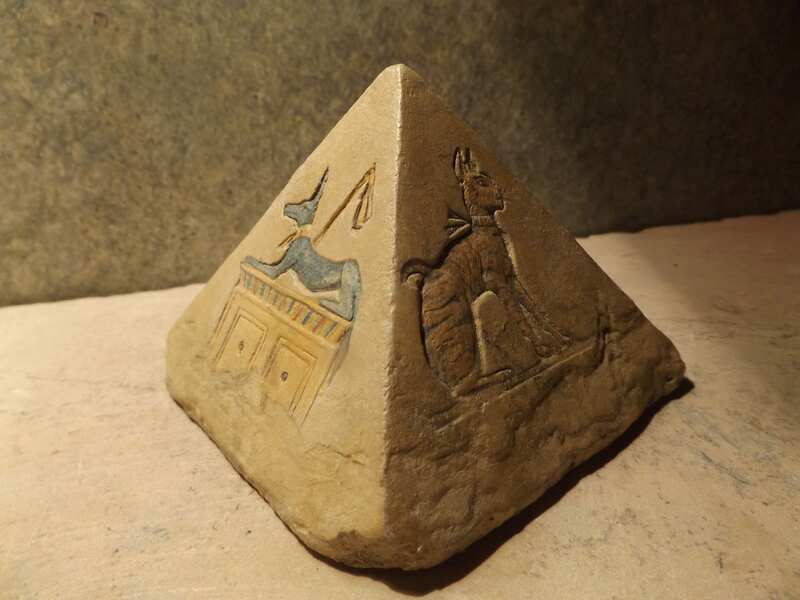 On offer here is a decorative pyramid, or more correctly, a pyramidion which was the last stone placed at the apex of the pyramid's superstructure. Made of a limestone and quartzite composition stone, this particular signed example has fine hand painted details. *Sign up for a newsletter if you like for updates on new releases and work in progress. 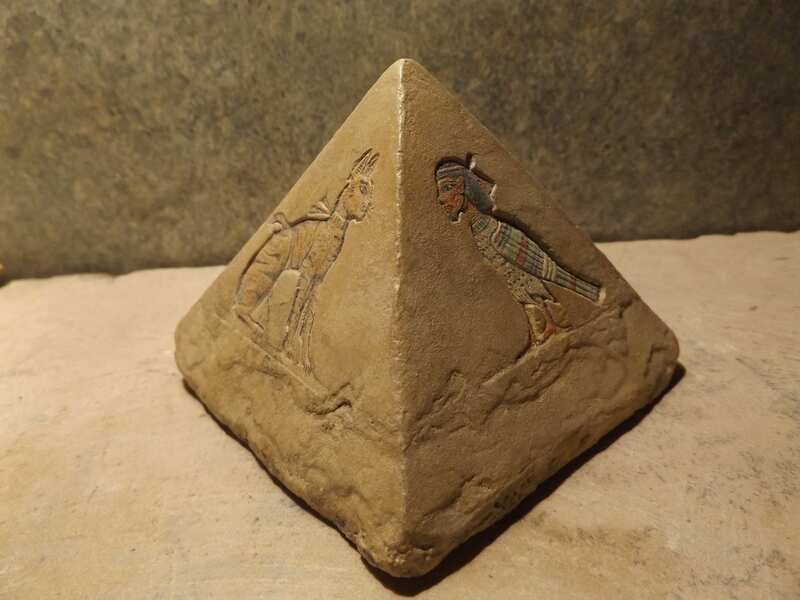 Pyramids are the ultimate icon of ancient Egyptian culture. Over 100 have so far been found. Most reduced to sand covered rubble, all without their capstone or 'pyramidion'. 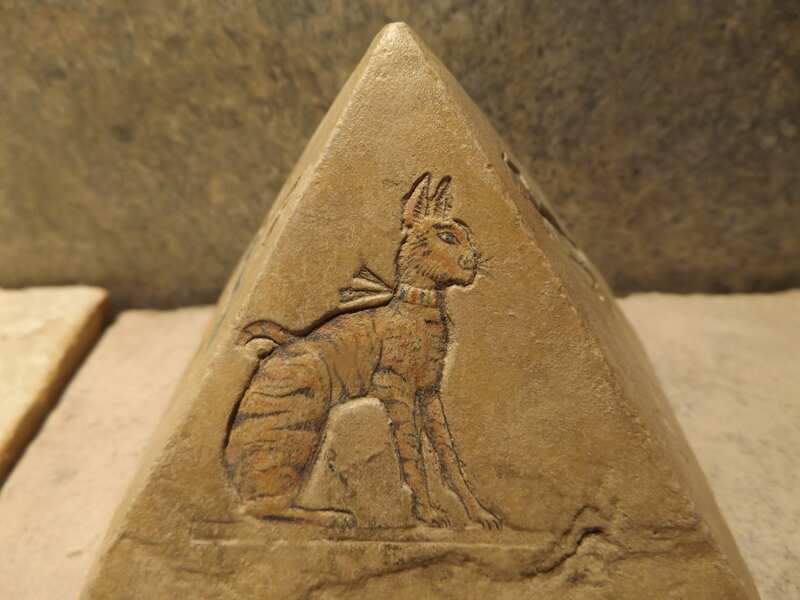 Some of these are in museums while the so called red pyramid of Seneferu built at Dashur, has the broken remains of its' pyramidion on display at the base of the monument. 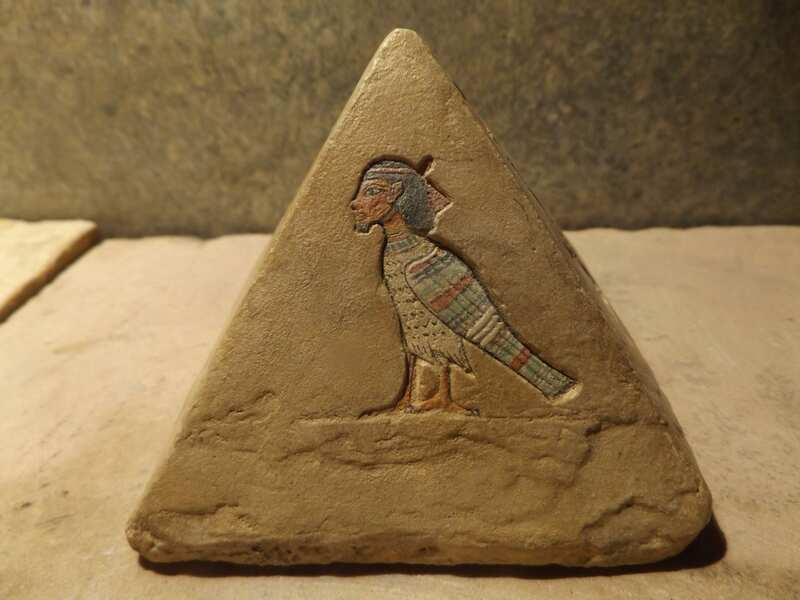 The pyramidion usually featured carvings of the kings name, religious figures and symbols such as the winged disc of Ra. 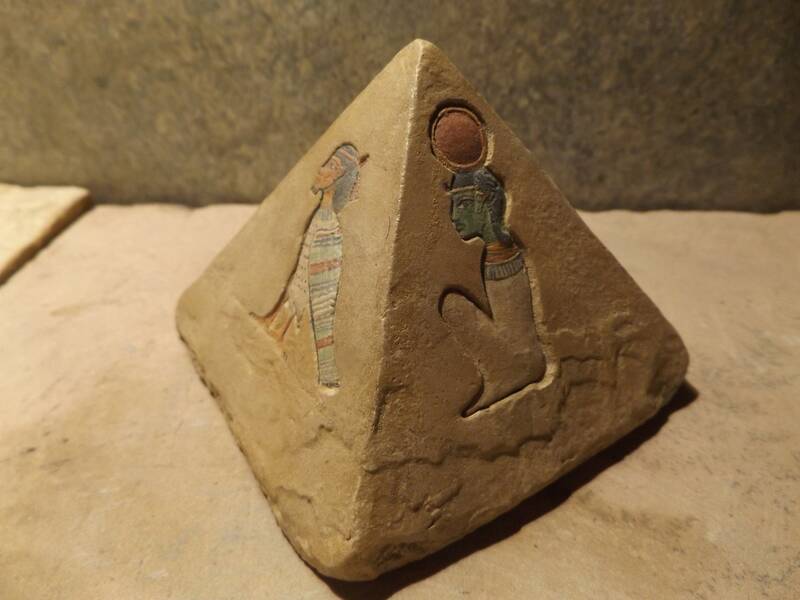 Private burials 1000 years after the great old kingdom pyramid age began a revival of sorts featuring small pyramids of a few metres above subterranean tomb chambers. 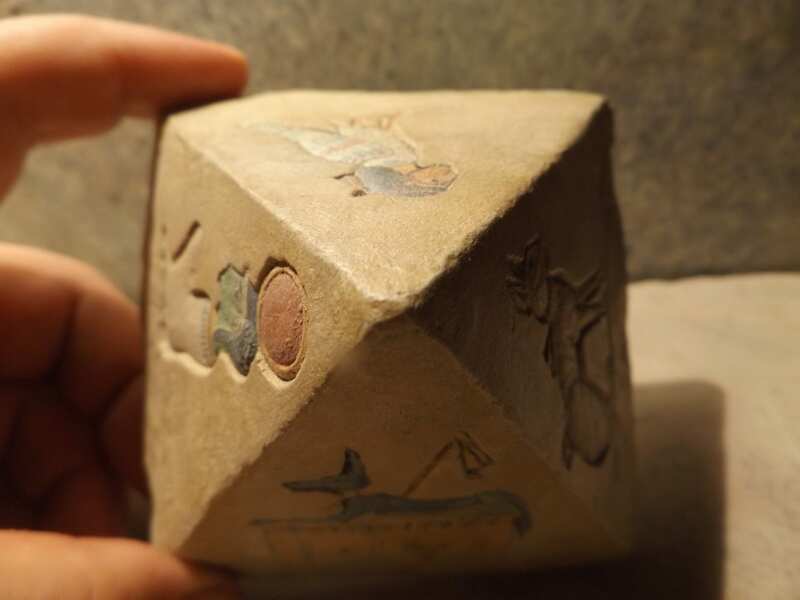 They also had stone pyramidions of the owner in the state of worship to his favourite god. 1. Bast - Cat god of music, dance and joy. 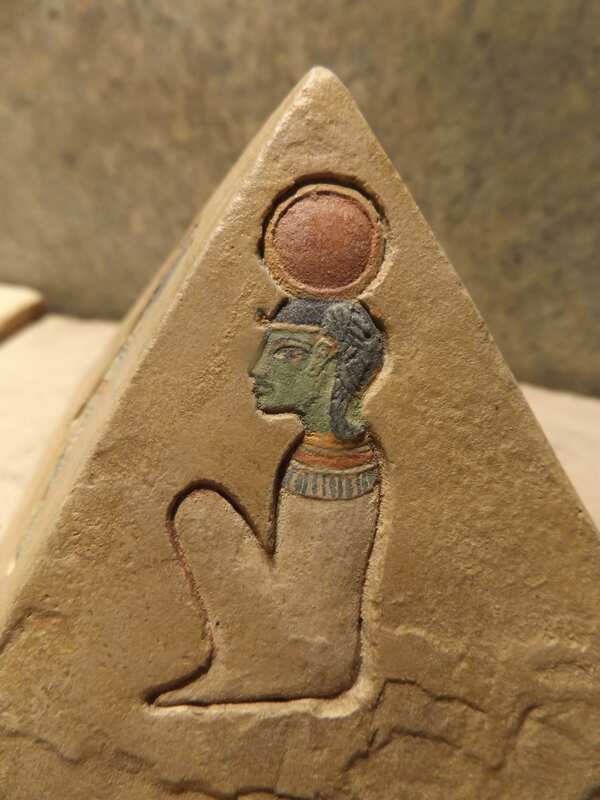 Also a principal protector god as she was said to sit at the bow of the boat of Ra as it sailed through the 12 gates of night to slash Apep / Apophis the serpent that could cause chaos with their night journey and thus prevent the sun from rising. 2. 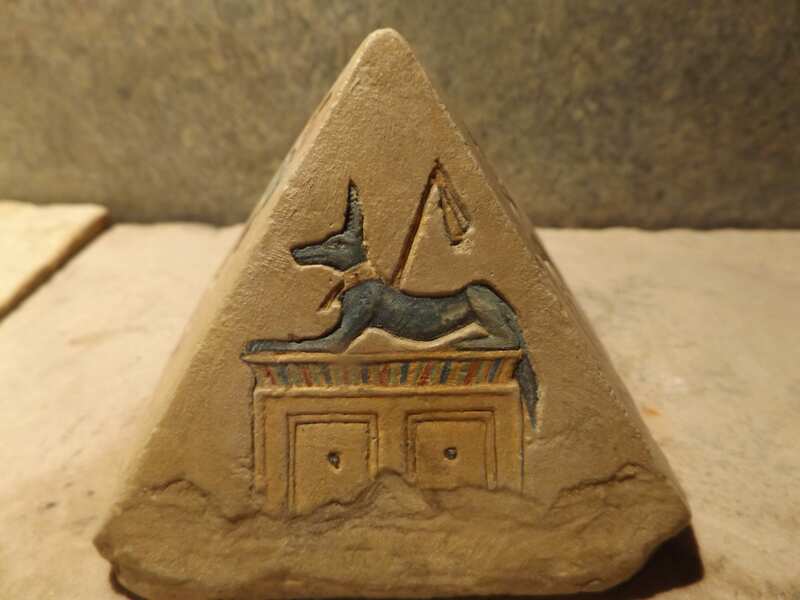 Anubis - A reclining figure of Anubis atop a canopic chest. Guardian of the west. Guardian of the dead. The maker of the first mummy. 3. Khonshu - The moon god. The night eye. Usually shown with the sidelock of youth and the disc of the moon on his head. On the pyramid he is shown thus and in a seated position. 4. Ba - The soul bird. 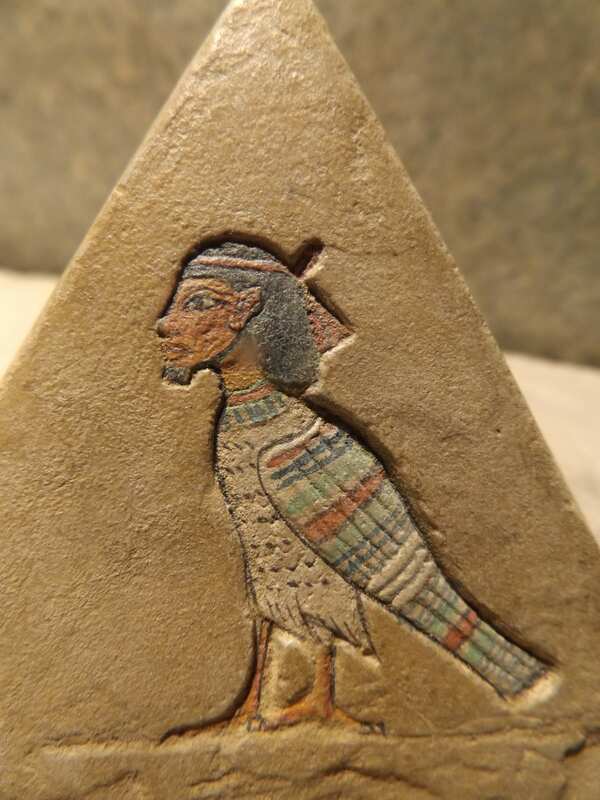 Ba was a mythological bird with a human head that would fly out of the tomb during the day to visit relatives and feel the world and return back to the tomb at night. Often shown at the base of the sacred sycamore tree being watered from the Hathorian tree goddess. She was providing provisions for the soul bird on his journey and could be shown with his or her partner in life. These depictions show the Ba with arms and cupped hands to catch the water.